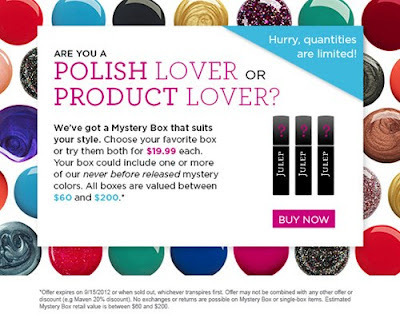 The newest mystery box by Julep is kind of interesting for me. You can choose to buy a box containing only products or only polishes, OR you can buy both boxes (or even multiples) if you want to. This is open to everyone, whether you're on the Maven program or not and it promises to contain 60-200$ worth of products. I bought one mystery box from them in June that you can see HERE and it was of the smallest ones in terms of value. Still not bad though. I got 3 polishes, a top coat and a lip balm. I'm very interested in the products box and I might just go for it but right now the website is down (overloaded I guess) and I will decide after I take a look at what exactly I might get in the products box. I like a lot of their products but I don't remember everything they offer so if there are too many products that I don't really want much, I'll pass. I'm thinking it will be 3 products in the basic products box because from what I remember a lot of their products are about 20$ regular website price like the Pedi Cream that I like. I also liked their lip vernis from THIS box and I guess I still do but it has started separating... I found it that way on my car floor and it had probably been in there for many hot days but I've still never seen this happen in a product. It smells and looks the same on the lips though but I can't seem to mix it back up perfectly. So this is FYI, people who are considering a products box since you might get this product in there. Are you Julep fans? Are you going to go for it? I LOVE julep, but I have been waffling over whether to get this mystery box - I have wayyyy too many polishes (so definitely will not be getting the polish lovers), and while I do love their products, I also have wayyy too many lip glosses/mascaras and am scared I'll just get more with this product lovers box! Can't wait to see what you get though! i would take products over polishes any day. I went for the products box and got a notification yesterday that it had been sent out. I expect it in the middle to end of next week so I'll be posting what I got!